Albert Einstein once noted that the most powerful force in the universe was the principle of compounding. In investing, this manifests itself through something called compound interest. In simple terms, compound interest means that you begin to earn interest income on your interest income, resulting in your money growing at an ever-accelerating rate. In other words, if you have $500 and earn 10% in interest, you have $550. Then, if you earn 10% of interest on that, you end up with $605. And so on and so forth until you have a very hefty sum of money. It is the reason for the success of every person on the Forbes 400 list, and anyone can take advantage of the benefits through a disciplined investing program. Benjamin Franklin was famous explaining to people that it was the best way he knew how to get rich. The interest rate you earn on your investment, or the profit you earn. If you are investing in stocks, this would be your total profit from capital gains and dividends. Time. The longer your money can remain uninterrupted, the bigger your fortune can grow. It's no different than planting a tree. Naturally, the tree is going to be larger when it is 50 years old than it was when it was 20 years old. The tax rate, and the timing of the tax, you have to pay to the government. You will end up with far more money if you don’t have to pay taxes at all, or until the end of the compounding period rather than at the end of each year. That's why accounts such as the Traditional IRA or Roth IRA, 401(k), SEP-IRA, and such are so important. The concept of compound interest is the foundation of the time value of money, which states that the value of money changes to a person depending upon when it is received. Earning $100 today is preferable to earning $100 several years from now. After all, if you have it in your hand immediately, you can invest it to generate dividends and interest income. After that, you can spend it on things you want, you can pay down your debt to lower your interest expense, or you can give it to charity. By postponing the receipt of the $100, you are losing something economists call opportunity cost. When you learn about the time value of money, you'll learn the formulas that show you how to calculate compound interest. This will empower you to answer questions such as, "If I need $1 million for retirement 30 years from now, and I can save $800 per month and earn 8% per year on my investments, will I reach my goal?" or "I'm putting $12,000 per year into variable annuities that I expect to earn 7% for 18 years. How much will they be worth, when I'm ready to cash out of the investment?" The best way to understand these concepts is to put them into a compound interest table that shows you just how substantially your wealth can be helped, or hindered, by small changes over time. Imagine you have an investor who sets aside a lump sum of $10,000. Take a look at the compound interest chart at the bottom of the page to see the influence of time and rate of return on his ultimate wealth. Once you understand this, it becomes evident that saving money alone doesn't explain why some people have bigger fortunes than others. For instance, a 20-year-old that invests $10,000 today and parks it in Treasury bills, earning 4% on average for the next 50 years, will find himself with $71,067 if the purchases were made through ​a tax-free account such as a Roth IRA. Had he invested in stocks and real estate, earning a 12% average rate of return over the same time, he would have ended up with $2,890,022. Adding higher returning asset classes would result in more than 40 times more money thanks to the power of compound interest. If that doesn't convince you that taking the time to learn about and understand investing is worth the effort, nothing will. 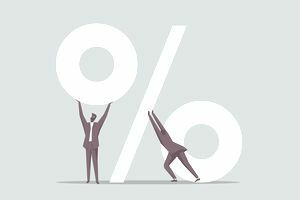 One glance at the compound interest chart and you may want to do whatever it takes to earn the higher rate of return—in this case, 16%. That can be dangerous. Unless you know what you're doing, no matter how successful you are along the way, you always want to avoid the possibility of losing all your savings. In finance, 20%, 40%, 60% returns in the first years are great, but if there is a -80%, -90%, or -100% in there anywhere, it's game over because you will have lost your capital. Without capital, you can't make investments that will later grow. Benjamin Graham, known as the Father of Value Investing, was aware of this risk when he said that more money had been lost reaching for a little extra return or yield than has been lost to speculating. He warned that it is one of the greatest temptations new investors face when building a portfolio.